سبزی خوردن Sabzi khordan refers to an abundant mixture of fresh herbs and vegetables served every day alongside most main meals. 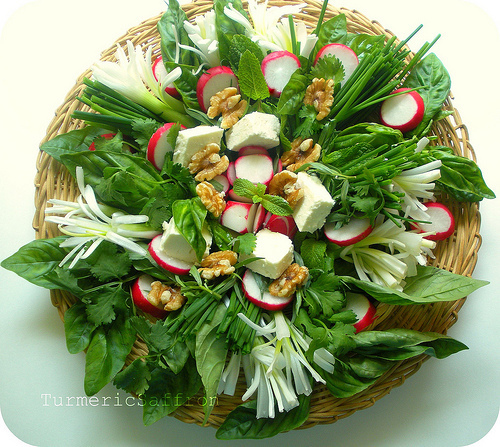 The word سبز "sabz" means green and سبزی "sabzi" means herbs/vegetables and the word خوردن "khordan" means eating. Eating greens and vegetables with almost every meal is an essential part and deep-rooted tradition in the Iranian culture. Iranian cuisine revolves around using fresh and seasonal vegetables in cooking and serving them fresh on a daily basis. 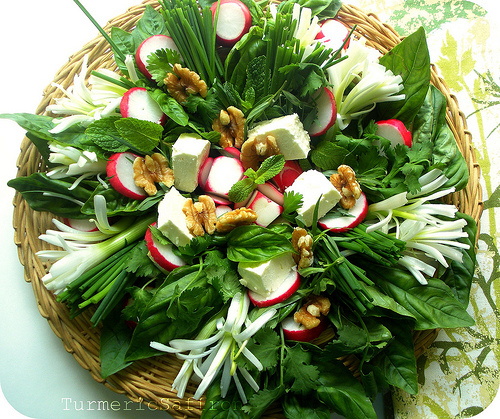 A traditional Persian plate of fresh herbs usually consists of basil (rayhan), mint (naana), tarragon (tarkhoon), chives (tareh), radish (torob-cheh), scallion (piaz-cheh), cilantro (geshniz), parsley (jafari), dill (shevid), and Iranian watercress (shaahi). For many of us who live outside of Iran and who may not be able to find the exact herbs that we are used to, we've learned to substitute. 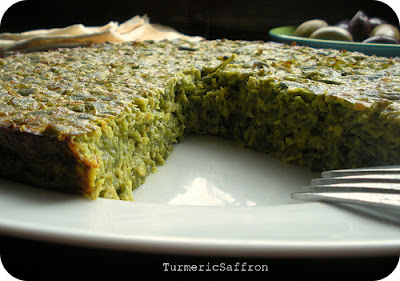 For example, instead of using "tareh" I use chives in sabzi khordan and in cooking I use the green part of scallions or leeks whenever the recipe calls for "tareh." Typically, a platter of washed and trimmed herbs is placed on the table and is passed around for each person to take a handful. 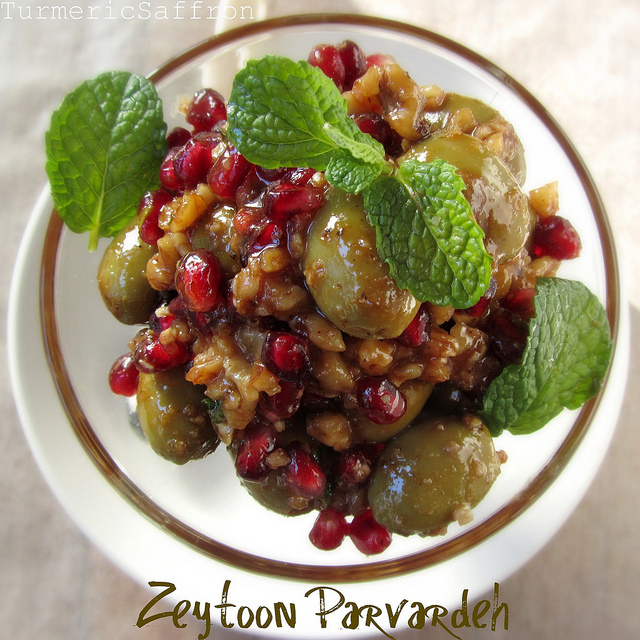 This aromatic, flavorful, and nutritious side enhances the taste of any dish including all Iranian polow and khoresh dishes, kababs and kotlets. نون و پنیر و سبزی Noon paneer sabzi consists of fresh herbs served with feta cheese and flatbread like lavash or pita bread. To me, this herb, cheese and warm bread with the addition of walnuts is a perfect meal all by itself. This is a healthy, light and tasty meal with no cooking involved! What more can you ask for? Use a bunch of each of the following herbs. Create your own combination. Trim the herbs, remove the stems of parsley, dill, cilantro, basil and mint. Remove the leaves of radishes and the green parts of the scallions, (you may serve them if desired). Make sure every herb is trimmed into small and bite-size pieces. Rinse all herbs thoroughly including packaged herbs. Place the washed herbs in a colander and drain. 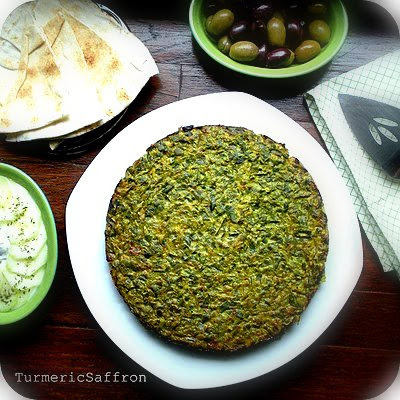 Place the herbs on a platter and serve with feta cheese, walnuts and warm bread. 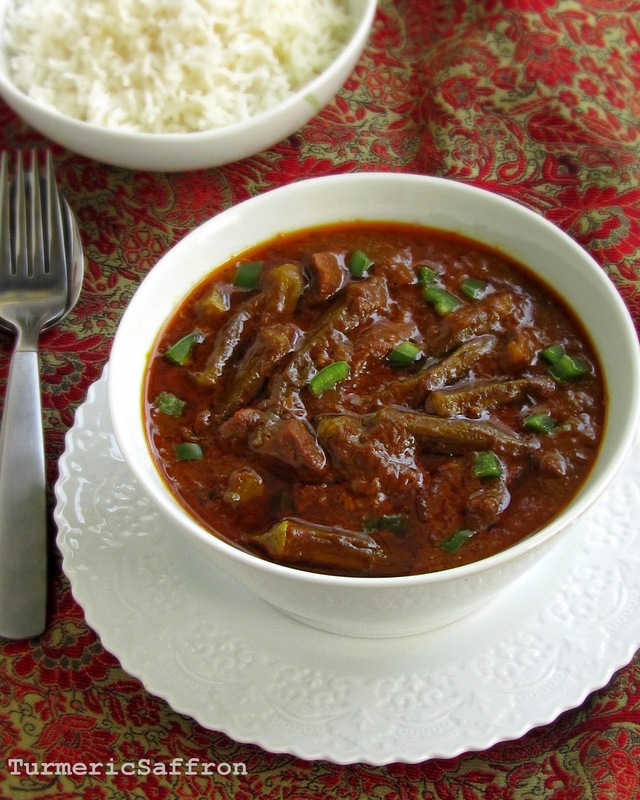 This is a tangy, hot and flavorful dish made with tender okra, sour tamarind sauce, lots of garlic and hot pepper slowly simmered in lamb stew. I was born in the city of Ahwaz, Iran and I spent a large part of my childhood and youth in the southern province of Khuzestan and Maman's most delicious خورش بامیه khoresh bamieh has been a favorite of mine ever since. I have cherished this recipe so much that I don't make okra with anything else but tamarind sauce. Tamarind to okra is what tomato is to eggplants! 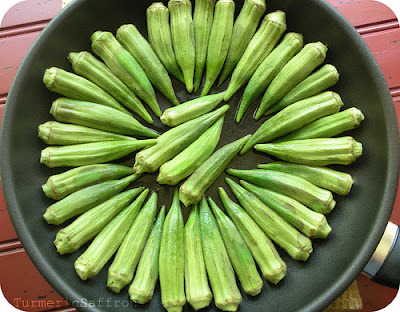 Over the years, however, every time I've cooked and served my version of okra stew to my Iranian friends I've had to explain that this is how my mother used to make it at home and it's the only way I know how to make okra. I've learned that most Iranians make the stew with tomato sauce. 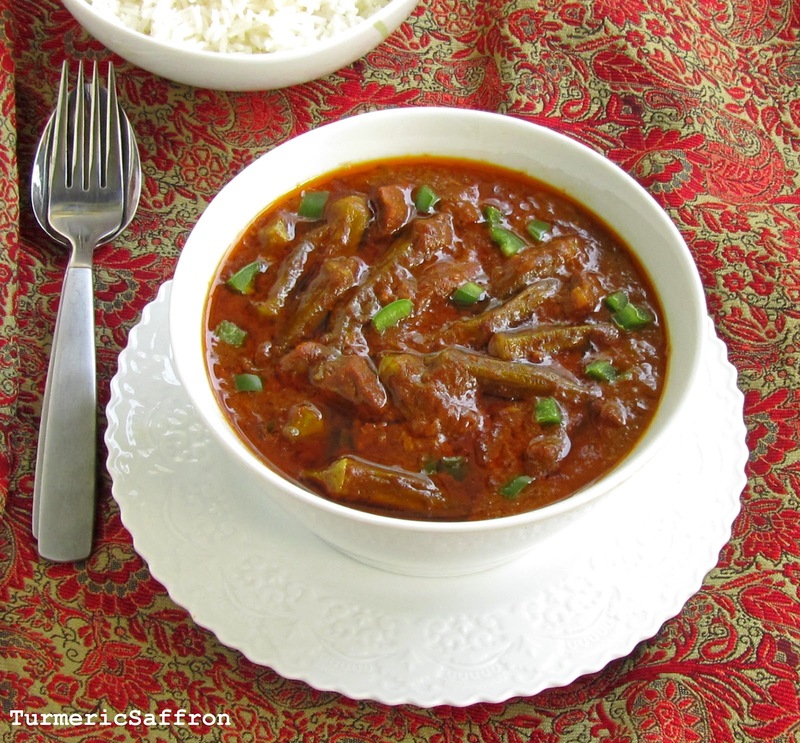 I'm sure it tastes good and I might even try the tomato sauce version one day, but till then I think this is the best and the most flavorful okra stew out there! Southern Iranian khoresh bamieh, my Maman's recipe, is supposed to be hot, sour and garlicky! Place 7 ounces of tamarind paste with pods in a bowl. Cover with 1-2 cups of hot water for an hour to soften. Then with a spoon/fork or your fingers try to get the pods separated from the pulp and get the juice out. Add more warm water if needed. Discard the seeds and strings. Pour the tamarind liquid in a jar with tight fitting lid and store in a cool and dry place. In a large pan, heat 3 tablespoons of oil and saute onions on medium heat till golden. Add turmeric and garlic, saute for another 5-7 minutes. Add meat and brown on all sides. Add salt and pepper to taste. Add 4 cups of water, bring to a boil on medium- high heat. Lower heat, cover and cook for 45 minutes or till meat is tender. In a separate skillet, heat 2 tablespoons oil, saute okra lightly over medium heat for 2-3 minutes. Set aside. Fry tomato paste in a tablespoon of oil for a couple of minutes over low heat. Add tomato paste and tamarind sauce to the pan, cook for another 10 minutes on medium heat. Add the fried okras to the pan and cook for an additional 20 minutes to soak up the flavors. Adjust seasoning. Add water if needed. Serve hot with rice, yogurt, herbs and bread. This is a simple, easy and delicious dish that's a favorite in our home. It 's my stove-top version of chicken kabab (joojeh kabab) which I make quite often but never thought about writing a post on it until I made them yesterday and again today! This dish may be served with rice but we also like it with some salad on the side such as salad Shirazi or a fresh green salad with lemon dressing. The other day, while walking through the poultry aisle of the store, I noticed the stacks of neatly packaged chickens all labeled and priced. I remembered the early years of my life when we had chickens, roosters and ducks in our own backyard among tens of pigeons, and other animals moving around freely. Now, preparing and making dinner is so much easier and more convenient than in the past when people would really labor to put food on the table, and in many places still do. I'm glad I don't have to go through the cleaning and defeathering of chickens as my mother used to do back home many years ago! 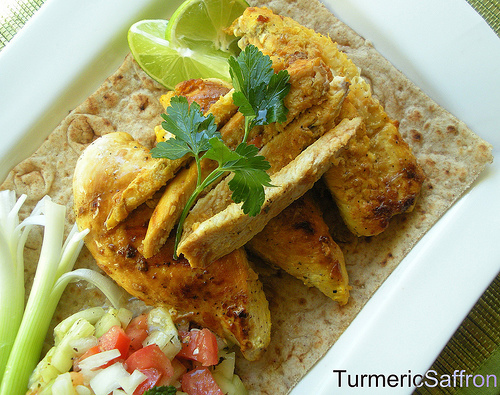 Cover and marinate overnight or for at least 10-12 hours in the refrigerator to blend flavors. Brush the surface of a skillet grill pan with a thin layer of oil and place on medium to high heat. Discard marinate and place the chicken on the grill and brown quickly on both sides. Then cover and cook for 20 minutes or until chicken is cooked through, remove from skillet and serve. Serve with salad, yogurt and bread or rice and grilled tomatoes. 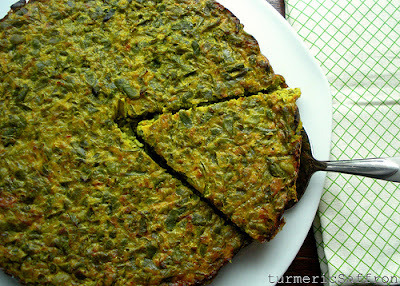 نرگسی اسفناج Nargesi Esfenaj is a great vegetable dish made with spinach, sauteed onions and eggs (sunny side up) on top. Narges (Narcissus) is a name of a beautiful spring flower and also the Greek mythology about a beautiful young man who falls in love with his own reflection in the waters of a pond and he perishes there, leaving narcissus flower to grow in his place. The name Narges is a girl's name in Iran and was my great grandmother's name, whom I've never met but have heard so much about, a woman with a great love for poetry, especially that of Hafez. Persian meals are usually served along with a plate full of fresh and seasonal herbs and vegetables (sabzi khordan) such as tarragon, basil, chives, mint, parsley, cilantro, radishes and scallions. 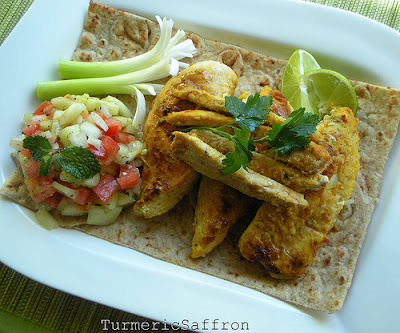 Cooking with herbs and vegetables is an essential part of Persian cooking. In addition to our meat based dishes we have our delicious and healthy vegetable foods as well. I often remind my kids to eat their fruits and veggies everyday! It's perhaps a part of being a mom that you tend to repeat things till you get the results you wish and hope for! It takes a certain skill, patience and perseverance to teach your children about nutrition and healthy food and to feed them well. Sometimes I feel as if I'm in a competition with the neighborhood pizzeria and Taco Bell and they get to win many times! I try to serve fresh herbs, green salads and fruits with every meal of the day. Heat oil in a large skillet over medium heat, saute onion till golden brown, add garlic, turmeric and saute for another 5 minutes. Add spinach, season to taste with salt and pepper. Cook for 5-7 minutes on medium heat. Break the eggs one at a time into a small bowl and then gently place it on top of the vegetables. Cover and cook for few minutes until the eggs are set. Serve warm on a platter with baked potatoes, yogurt and warm bread. 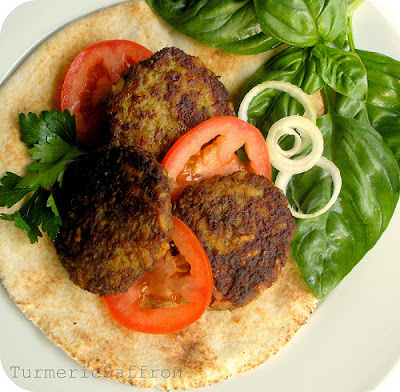 Kotlet is a super simple and super delicious Iranian ground meat patty. I can easily say that I grew up on kotlet. This was one of my mother's specialties and signature dishes that was made in the shape and as large as the palms of her hands. They were soft and tender inside and golden brown and crispy on the outside. On one of our summer travels en route to Tehran, we visited one of my father's acquaintances in a nearby town. The host insisted we stay for lunch and greeted us with great hospitality and warmth. They served a great meal but the kotlet was so dry and hard that to this day I remember how hard it was to chew. They kept insisting that we should eat more and clean our plates and to that one of my outspoken brothers, then eleven years old, said "well this kotlet looks like a shoe and tastes like a shoe!" I saw both my parents turn red and we had to hear a long lecture afterward about how we should thank people for their efforts in making the food and always show our gratitude and appreciation for what they've done by saying, "dastet dard nakoneh" which literally means (may your hands not hurt)! Margaret Shaida, the author of The Legendary Cuisine of Persia, writes in her book that, "the Russians fleeing the Bolshevik Revolution brought these meat patties to the Caspian province and Tehran in the early part of this century." 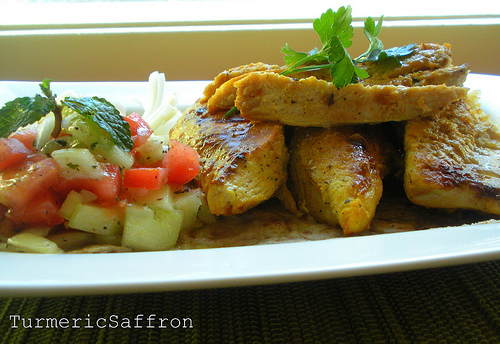 Since then kotlet has become a common and popular meal in Iranian cuisine. 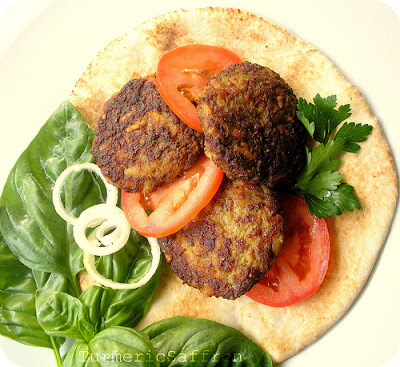 I had posted a kotlet recipe before but this is a simpler and quicker version of it. Place a frying pan over medium heat and pour 2-3 tablespoons of vegetable oil in the pan. Take a handful of the meat mixture, shape into a ball, flatten into an oval or a round shape and fry till brown on both sides. If needed add more oil. Serve warm or cold with herbs, sliced tomatoes, onions, pickles and warm bread. کوکو لوبیا سبز Green beans (loobia sabz) makes a great side for most meat and chicken dishes and may also be served as a light and healthy vegetarian dinner. There are other popular and tasty Iranian dishes made with green beans such as, Rice with Green Beans (Loobia Polow) or Chicken with Green Beans (Khorake Morgh) which both are a favorite of mine. I may sound like a broken record but I love all Persian food with the exception of perhaps one or two dishes, everything else is just unbelievably amazing! Fresh green beans are best when they are in season during the summer. Where I live, however, I can buy them all year around yet I still prefer buying the frozen packages which are already cleaned and cut, it saves a little time. Have you noticed that there are no more strings in string beans? Whatever happened to them? I guess the same thing that happened to the watermelon seeds over the years! Wasn't it annoying to remove all those strings one by one? Cleaning string beans used to be one of the chores that I didn't care much about at all. It wasn't easy to take hold of the tip of the string and pull it down the side all the way to the end without breaking it in at least two places. Compared to that cleaning the rest of the vegetables seemed relatively easy. Heat oil in a small frying pan on medium heat. When it becomes hot add onions and saute until golden, add turmeric and stir. Add chopped garlic cloves and saute for another 5-7 minutes. Set aside to cool. If using fresh green beans, remove the ends and wash. If using frozen beans leave out to thaw and rinse. Place green beans and 1/2 cup of water in a medium size pan and bring to a boil. Add a pinch of salt and cook for 5-7 minutes on medium heat until they soften. Remove from heat, drain and let it cool. Chop up the green beans and the green bell pepper finely if you like a smooth kookoo. I leave them somewhat coarse. It all depends on your taste. You may also chop the vegetables before steaming them but I find the process to be easier afterward. I use a food processor and pulse it a few times for each batch. In large mixing bowl combine all ingredients and mix well. Pour the mixture in an oven proof serving dish, cover loosely with a foil and place in the 350 degrees preheated oven for about 45-50 minutes. Remove the foil in the last 20 minutes. 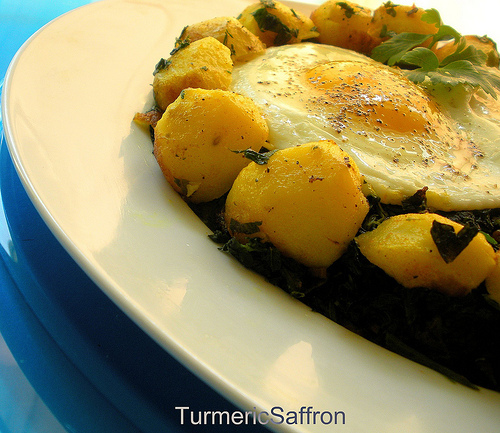 Serve with warm bread, mast o khiar, torshi and salad.